Did you know that we communicate nearly as much through the expressions we make with our brow and eyes as we do by talking? When we’re young, our faces generally reflect the mood that we’re in, but as a person ages, sagging skin and creases etched across the forehead can cause an individual to appear tired, worried or angry, even when they feel great. A brow lift addresses these unwelcome signs of aging by lifting sagging tissues and removing excess skin, restoring the brow to a more natural position. You may be a candidate for a brow lift, also called a forehead lift, if you have a sagging forehead or brows that hang too low and too close to the eyes. 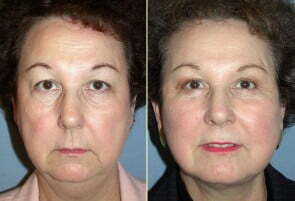 You may also desire a forehead or brow lift if you have deep vertical furrows between the eyebrows (frown lines). A brow lift is intended to give a more youthful and rested appearance to the forehead and upper eyelids. Brow lift surgery is done on an outpatient basis under general anesthesia or monitored sedation. Dr. Movassaghi performs surgery at McKenzie Surgery Center or Sacred Heart Medical Center in Eugene, Oregon. The incisions are usually made behind the hairline. For patients with high foreheads, the incisions can be placed in front of the hairline. The operation is done using an endoscope, a narrow hollow instrument with a fiber optic light source and camera, through which the procedure is done with small special instruments. The forehead skin is lifted and repositioned. The muscles that cause frown lines are weakened. Initial discomfort is easily controlled with oral medication. Sutures or staples are removed within 10 days and most swelling and bruising is gone in 7 to 10 days. Additional procedures that may enhance the result of a forehead lift are Lower and/or Upper Eyelid Lift, Face Lift, or other Facial Plastic Surgery in Eugene, Oregon or implants. Browlift is considered cosmetic and therefore is not covered by insurance. The patient is responsible for payment. The specific risks and the suitability of the forehead lift procedure for a given individual can be determined only at the time of consultation. All surgical procedures have some degree of risk. Minor complications that do not affect the outcome occur occasionally. Major complications are unusual.